Hobo spiders – found throughout the Pacific Northwest. Body: the female is about 1/2-inch long; males are about half as long. Coloring: shiny black with distinguishing mark noted below. Prevalent throughout the United, most commonly in the south and the west. 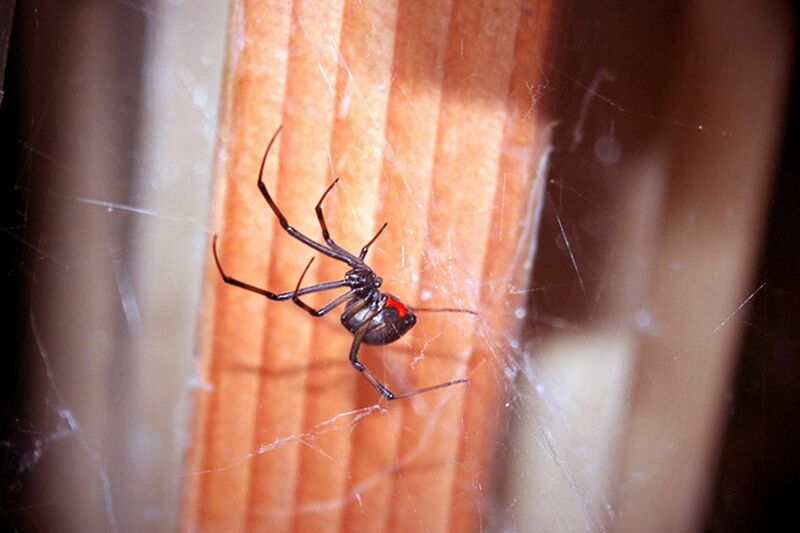 Black widow spiders seek shelter in out-of-the way, undisturbed areas. Outdoors in woodpiles and areas of accumulated debris or rubble; in hollow stumps and rodent burrows; in sheds, garages, and outhouses; and even in porch furniture. Indoors in cluttered areas, particularly in basements and crawl spaces. The black widow builds its irregularly shaped, tangled web between objects, under rocks and logs, along embankments or in outbuildings. If disturbed, the spider can hide in a tiny funnel of the web. This spider's longish legs enable it to scurry quickly. See video. The most common cause of human bites is when a person inadvertently contacts the black widow spider web. For other possible spider bite symptoms, see Venomous Spiders. This spider feeds on insects caught in its web as well as lizards and small snakes. Black widow spiders are not aggressive toward humans, preferring to flee rather than fight. But they will bite if provoked or in defense. The bite of this spider is fairly easily distinguished because it leaves two puncture marks in the skin. The initial symptom is pain in the area of the bite, similar to a pinprick or even little felt at all. Within about 15 minutes, a dull pain spreads to the muscle of the chest, abdomen, back and/or across the body. pain for up to about 12 hours or several days. in extreme cases, particularly just before death in children, seizures can occur. Death is rare, but the young and the old and the extremely ill are most susceptible. Severe symptoms generally begin to improve within three days, but mild symptoms may continue for weeks or months. If bitten, seek emergency medical attention immediately. OSHA also advises the placement of ice on the bite area for 10 minutes on then 10 minutes off, repeating the process. In addition to general spider control methods, in areas where black widow spiders are prevalent, control should target this spider's webs because it spends the majority of its time in its web. Inspection for the spider will be most effective if conducted at night when the black widow is active. Get Rid of Spiders in Your Home! Should You Be Afraid of Tarantulas? How Dangerous Is the Wolf Spider's Bite?